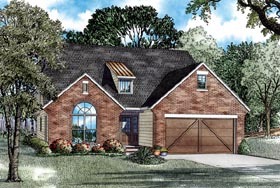 This uniquely designed home plan is featured in our Arts and Craft Collection. It has a lot of character with its shed style garage door and beautiful arch window. The front entry leads to a lovely foyer bordered with columns and a huge dining area. The family will enjoy the comfortable space between the breakfast nook and great room, and as your day begins to wind down, you can relax in your box ceiling master suite and bath with an amazing whirlpool tub and large walk in closet. Feel at home with this desirable home plan. It is everything that you are looking for.